. : Spotlight SALE Items :.
.: Top Ten Other WW Sites :. 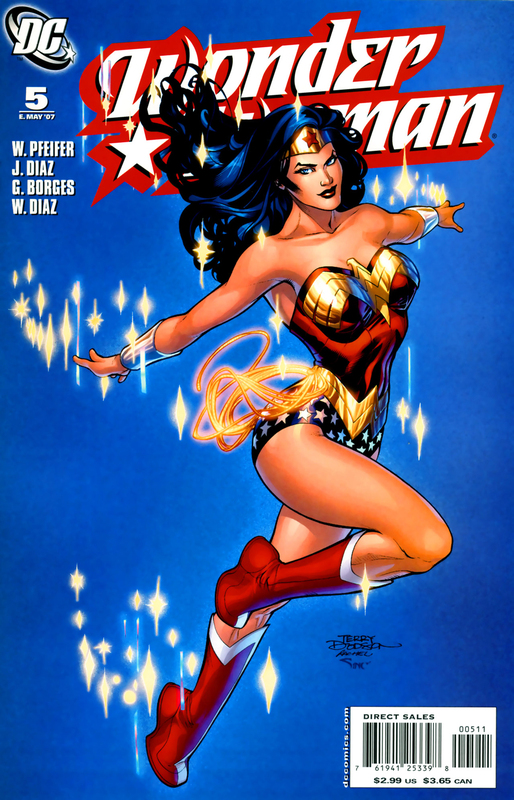 Written by Allan Heinberg; art and cover by Terry Dodson and Rachel Dodson. 32 pages, $2.99, in stores on February 14, 2007. 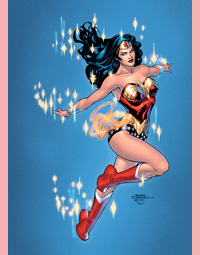 Concluding the 5-part story "Who is Wonder Woman?" The combined forces of Wonder Woman's transformed rogues gallery declare all-out war on the amazing Amazon, compelling the all-new Wonder Woman to mend fences and join forces with her predecessor and with Wonder Girl if she's going to survive to finally answer the question: "Who Is Wonder Woman?" 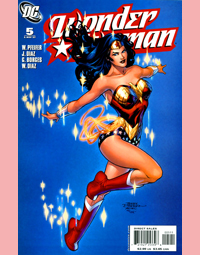 Concluding the 5-part story "Who is Wonder Woman?" The combined forces of Wonder Woman's transformed rogues gallery declare all-out war on the amazing Amazon, compelling the all-new Wonder Woman to mend fences and join forces with her predecessor and with Wonder Girl if she's going to survive to finally answer the question: "Who Is Wonder Woman?" Retailers please note: This issue is resolicited; all previous orders are cancelled. NOTE: This issue was delayed and resolicited. Actual shipping date was February 21, 2007. The story for this issue would eventually appear in Wonder Woman Annual #1 (Series III). Written by Will Pfeifer; art by Jean Diaz, Geraldo Borges, and Wellington Diaz; cover by Terry & Rachel Dodson. Click on Each Image Below to bring up a LARGER version! Note: if a link doesn't work, please email the webmaster! 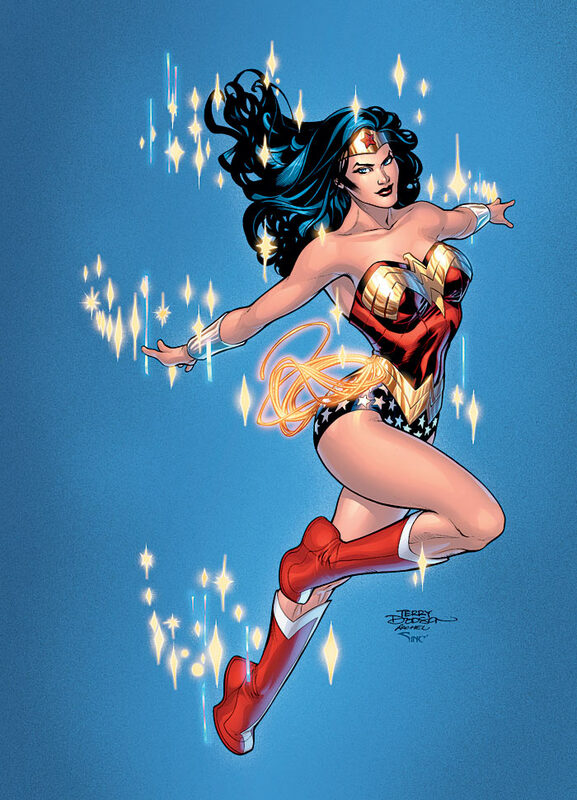 Catch almost all of Wonder Woman's THIRD series adventures in paperback or hardcover! DISCLAIMER: "WONDER WOMAN" and all related names, characters, and elements are trademark and copyright 1942-2011 by DC Comics. Material from the "WONDER WOMAN" TV series and its related elements are the property of DC COMICS and WARNER BROS.
All rights reserved. Wonder Woman was created by William Moulton Marston. authorized by DC Comics or Warner Bros. This website is NOT A COMMERCIAL SITE. Website design by Andy Mangels. Website logo and help by Kehvan Zydhek. Please do not repost content from this website without permission. This website went live on January 1, 2004!